Earlier today, I read a sort of post mortem from Radiangames’ Luke Schneider about his recent release of Slydris 2, which I’ve been pretty obsessed with over the last week. In it, he talks about how stressful it is to release a free-to-play game on the App Store, especially as a solo dev. Instead of creating a game, feeling good about it and selling it to people, the developer has to basically break the game to find ways to monetize it. He did so in a very fair way, thorough occasional forced ads and opt-in ads you can watch to earn extra gems. These gems don’t affect gameplay in any way, though. They only buy themes and other features that you can live without. But you can also just pay a one-time fee to unlock all themes and remove ads, essentially making it a premium game. To me, this is a win/win situation, but he says that it led to too much confusion. I, too, wanted to make sure before I spent money on it that there wasn’t any way to watch an ad to get a higher score, as in so many free games these days. So he says he’s not sure he’ll make his next game free, as it’s too stressful and time-consuming to figure out how to do so profitably. It’s well worth a read, but the reason I bring it up is that over the last few days, I played through Humbug, a puzzler that, had it been a straight up paid game with no nonsense, would have been one of my favorite games this year. But instead of showering it with praise, I was loudly sighing and cursing in my gameplay video and on Twitter. Let’s first talk about the gameplay itself. 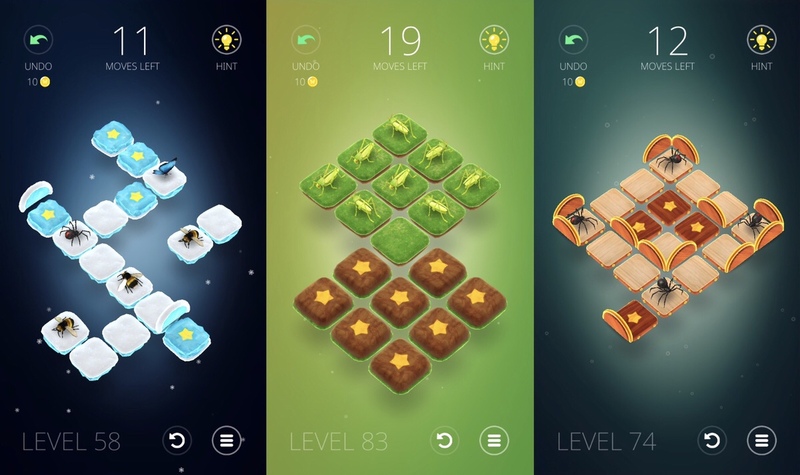 It plays with one hand in portrait mode, as the controls simply involve swiping different insects and other creatures to move them across tiles. The goal is to land each creature on a star, at which point it will vanish from the board. 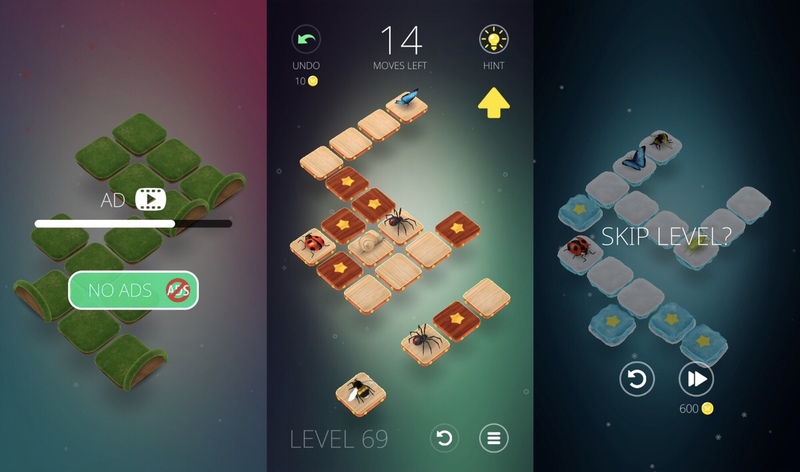 You have a limited number of moves in each puzzle, so you really need to think creatively. To make things interesting, the creatures all have different movement patterns. For instance, a snail only moves one tile over. A spider keeps moving until it hits an obstacle. A ladybug moves two spaces over, and a grasshopper jumps up to the next tile over, but can also jump over other insects. As flying creatures are added, the possibilities really open up. You may need to use a ladybug to prevent a spider from falling off the edge of the board, or use a snail to make a bee land one space further than he normally would. For most of the game, I had to pause and think about the solutions, with some real head-scratchers stumping me for a bit. The game has a hundred levels, with new creatures added every once in a while to gradually ramp up the difficulty. It felt like the perfect amount of content, as I wasn’t done with it too soon, but it wasn’t long enough to wear out its welcome. There also wasn’t much filler, so my time felt worthwhile. I could have done without the occasional tutorials on each bug, but that’s a minor thing that’s easy to forgive. On top of that, the presentation is impressive. The insects are realistic, and I love watching them move, even though I don’t normally like spiders or bees. The sound effects of each bug as it moves is also spot on, and the different environments offer some variety and eye candy so you’re not looking at the same kind of tiles and backgrounds for a hundred levels. The music is also subdued and, coupled with ambient nature sounds, I felt completely relaxed and never even considered shutting the sound. Even the controls are flawless. Normally, a game with multiple pieces to move through swiping would lead to at least a few mis-swipes, but I don’t think I experienced even one. The creature I wanted to move always moved in the direction I intended, even with my chubby fingers and several insects grouped together in tight formation. The game itself oozes quality and is an absolute joy to play. I wish my review could stop there and be just about the game itself, as then it would be short and full of nothing but praise. But since the monetization is up front and center, I couldn’t ignore it. So let’s break it down. First off, there are forced ads after every few levels or restarts. There’s a $2.99 in-app-purchase (IAP) to remove those ads, and I would have gladly paid that if not for all the other tacky and obnoxious attempts at monetization. To me, a free game with ads and an ad removal IAP to make it a stress-free, premium experience, is as user-friendly as you can get. It’s a great way for developers to allow those who can’t or won’t spend money to still enjoy the game with the tradeoff being the inconvenience of some ads. But those who can and are willing to pay don’t have to deal with the interruptions. Everyone wins. Except, paying to remove the ads in Humbug doesn’t turn the game into a hassle-free experience. As you can see in the screenshots above, early on the game introduces you to the hints system by forcing you to use them. 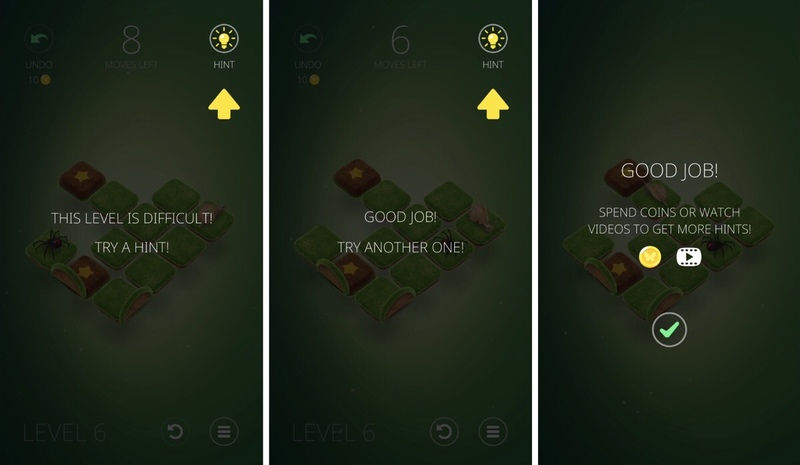 There is no way to refuse the hints, so that’s one level completed for you even if you wanted to solve it yourself. Still, that wouldn’t be a huge issue on its own. It’s not the ideal way of introducing hints to players, but if it stopped there, I’d have been only momentarily annoyed and moved on. The problem is, the coins and hints are constantly in your face. First off, there’s an undo button. I mention the existence of an undo button or lack thereof in just about every review I write about puzzle games. So it’s an important feature to me. But usually it’s either unlimited or limited for a reason related to gameplay. I complained about the lack of an undo button in Deus Ex GO and then blew steam out of my ears when they added consumable undos that you can purchase with real cash. That was the first time I’ve seen a game do that. And Humbug is the second time. 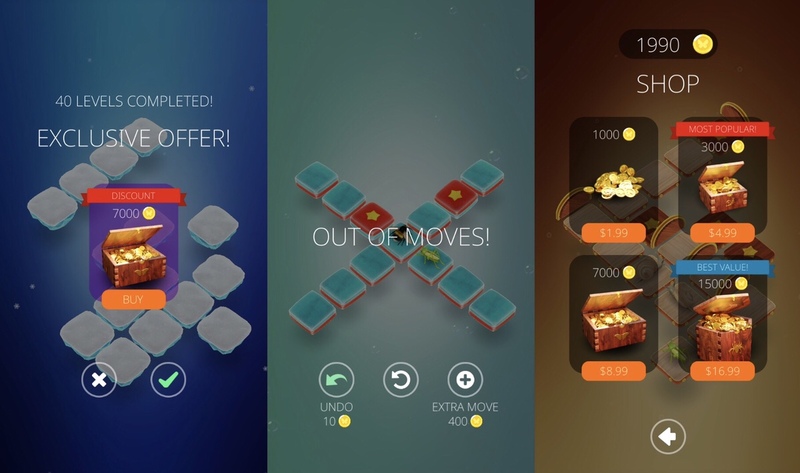 While it only costs ten coins to undo a move, consider the fact that you earn thirty for each solved level. If I used the undo button the same way I do in, say, Dissembler, I’d have run out pretty quickly. So instead I used it only occasionally and restarted the level each time I messed up. I would have rather had no undo button than an undo button taunting me the entire game that I couldn’t use without doing the math on whether I can afford to. On top of that, the hint button I mentioned earlier is always on screen, doing a little jiggle every now and then to get your attention. That would be annoying enough, but if you fail a level once or twice, a giant flashing yellow arrow will bring extra attention to the hint button and make you feel like a loser for not solving the puzzle on your first attempt. I don’t like using hints even if they’re free, but when they cost coins or an opt-in ad, it’s especially obnoxious to be constantly pushed towards using them. I complained about this in Aurora, where the hint button was the biggest button on the screen, as thought they wanted you to use it instead of actually playing the game. I got the same sense here. Even though I was thoroughly enjoying solving the puzzles myself, I felt attacked by that hint button. You have no idea how much it saddens/angers me to see a developer make a superb game and then focus their entire business model around encouraging the player to use hints instead of playing the game. It makes the whole experience feel unnecessarily tacky. Now, this next thing bothered me less, but I want to discuss it anyway. I mentioned earlier that each level has a minimal move counter. It makes sense for this game, as each puzzle is hand-crafted and designed to be completed a certain way. If you had a grasshopper take three turns to get three tiles over instead of jumping over other bugs, you didn’t solve it as intended. So it makes sense you should restart at that point. But often, games still allow you to use extra moves to complete the level, then come back later and try to optimize your solution. 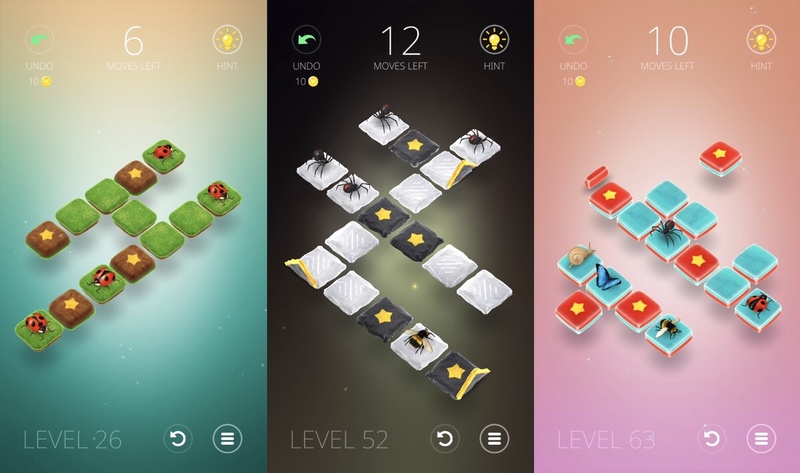 It’s a very user-friendly way of doing it, as the player can move on from a tricky puzzle without giving up completely. It also can help you figure out the real solution. But with Humbug, if you run out of moves you either undo, restart, or the game offers you an extra move for 400 coins. 400 coins for one extra move! Obviously I never bought one, but it’s just another example of how much the developers are trying to nickel-and-dime players. And you may also remember my piece encouraging developers to unlock all levels in a puzzle game instead of forcing hyper-linear play. Humbug has a skip button, but it costs 600(!) coins to use it once. Not only that, but often when you restart a level, it will offer a skip, and I’ve accidentally pressed that a few times. It wouldn’t be an issue in a game with free skips, but here it felt like I was intentionally tricked out of my hard-earned coins. And again, it’s another cost to keep track of instead of just playing the game. For context, you can buy 1000 coins for $1.99. So imagine how quickly that adds up if you actually want to use the skip button and undo button. I probably could have stomached the pushy coins system if there were no forced ads. But having both forced ads and this tacky and obnoxious currency system turned an otherwise lovely game into an unpleasant experience. I would have been happy to pay the $2.99 to remove the ads and the entire coins system. Hide the hint button in a drop-down menu and just let me play the game in peace. I did end up completing all one hundred levels of Humbug, but I had to jump through too many hoops to enjoy it. My experience was definitely marred by all the extra nonsense included just to try and monetize it as a free game. Had it been a premium game with a clean user interface and a hint button that was out of sight and out of mind, Humbug would have easily made it to my 2018 Game of the Year list. It checks off all the boxes I look for in a puzzle game and then some. So my recommendation is to download the game and give it a try, as it’s finely crafted. Maybe you’ll have an easier time stomaching the monetization model. And if not, hopefully the developer will listen and do something to make that aspect more palatable. But either way, download the game here and start swiping bugs. And if you need help, try my walkthrough guide.